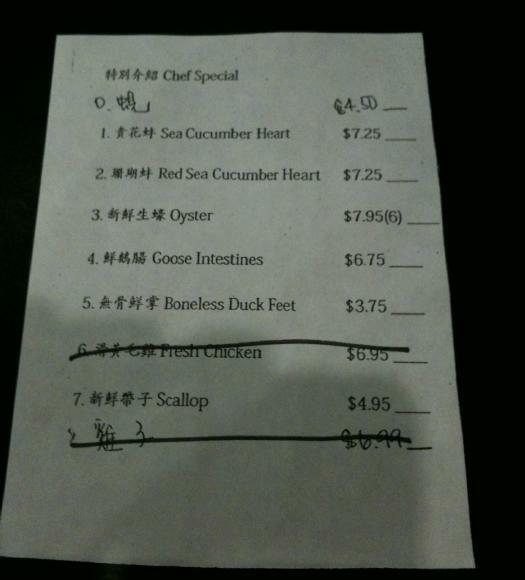 How does one begin to choose between the Sea Cucumber Heart and the Red Sea Cucumber Heart??? I don’t believe the menue you show above is a Shabu Shabu menue. Shabu Shabu is a Japanese food, but the menue is written all in Chinese. And there isn’t anything to indicate that it is Shabu Shabu. I see. It makes sense now. Shabe Shabu usuallly comes with a lot of vegetables. I guess you just need to ask before you order. Yes, I didn’t photograph that part of the menu… it was huge.